Thousands of conservatives flocked to the Minneapolis convention center Wednesday afternoon for a rally on behalf of Rep. Michele Bachmann and former Alaska Governor Sarah Palin, two heroes of the Tea Party movement. Though the rally was for Bachmann's reelection campaign, the controversial Minnesota lawmaker was the warm up act for Palin, who told an enthusiastic crowd that "the tea party is growin' and steamin.'" 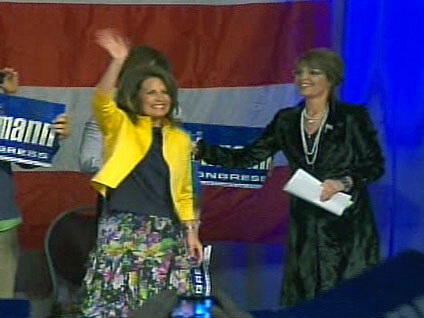 Introducing Palin, Bachmann, clad in a striking yellow jacket, told the audience: "She is so much one of us." Before Bachmann's speech, the two women emerged onstage together to the song "This One's for the Girls," by Martina McBride. In her remarks, Palin said studies had shown many of the Tea Party leaders are women. Bachmann said more than 11,000 tickets had been distributed for the event, adding: "Take that liberals!" She went on to criticize the Obama administration for its new nuclear weapons policy. "So if in fact there is a nation who is compliant with all the rules ahead of time...if they fire against the United States, a biological weapon, a chemical weapon, or maybe a cyber attack, then we aren't going to be firing back with nuclear weapons," said Bachmann. "Doesn't that make us all feel safe?" She stated her support for repealing the health care reform bill, saying "repeal is what this girl is going to be all about after November." Bachmann also complained of an "infamous monstrosity of a vote to nationalize effectively health care in the United States of America." Palin spent much of her speech lauding Bachmann for standing up to Democrats in Washington. "What's wrong with being the party of no when you consider what Obama, Pelosi and Reid are trying to do to our country? So be it," she said. "Not when it violates our Constitution!" Palin said it was good to be in Minnesota, where people hunt and fish and some are "clinging to your guns and religion like the rest of us." She told the crowd that many in Washington are "addicted to opium -- o.p.m., other people's money." She said a vote for Bachmann was a vote "for the principles that make this country great." Such a vote, she added, was a way to state that members of the military are "a force for good in this world and that is nothing to apologize for." "What do you say, Minnesota?" asked Palin. "Will you do the rest of the nation a favor and reelect Michele Bachmann?" Before Palin and Bachmann spoke, Minnesota Gov. Tim Pawlenty, who is widely expected to run for president, took the stage. "We now live in a country where Wall Street gets a bail out, the poor get a handout, and everybody else gets their wallet out," said Pawlenty. He said that the rule of law is "under assault" by the Obama administration because of the individual mandate in the health care bill. America, he added, is in a situation where there are "state sponsored companies that are too big to fail," "a federal government that is too big to succeed," and "national leaders that are too small to do anything about it." A succession of speakers preceded the three politicians, many taking shots at House Speaker Nancy Pelosi for what they deemed a "government takeover of health care." After the event's invocation, the host joked that any Democrats present would be offered therapy because the words "god" and "Jesus" had been spoken.